Reborn complete but not finished. Maturity is a process not a destination. There are mature 5 year olds and mature 65 year olds. The 5 y/o is not immature because she is not 65. You are not immature unless you are not growing in your ability to FOLLOW, FISH, WORSHIP,LOVE, GIVE, SERVE, PRAY, FORGIVE. Maturity is relative, but overall if we could plot spiritual progress on a chart, we’d hope it looks like a good retirement account – full of ups and downs, but overall trending northward. So first step, take some time this week to take inventory. In general are you more faithful, generous, joyful, knowledgeable, loving, forgiving than you were 5 years ago? Stop habits that stunt your spiritual growth. Continuing to walk in known, revealed, habitual sin after being REBORN is like smoking in elementary school, it stunts your growth. It stunts your spiritual growth and kills your body when your body should be growing. You will never completely stop sinning on this side of Heaven, but that is no excuse to keep pet sins. Find a way to eat more. Take one step to either increase the quality of food you’re eating or the quantity of food you’re eating. When I first started to grow in my faith, the fella discipling me, Chad Shelley is his name, told me, “Ruthy, if you’re going to grow you need to always be reading. Reading the Bible and some book about the bible.” I’d say the same to you. If reading isn’t your preferred learning method, then maybe go on iTunes and find a podcast. Find a musician that sings gospel truth and marinate in that on your way to work. Practice. Work out. Muscles get bigger when we use them. Senses are honed through repetition. Remember, you never learned to walk without falling. You never learned to ride a bike without trying. You never learned to read without errors, but you had help. Your momma or daddy or teacher or grandmomma held your arms and walked with you. Spiritual growth happens the same way. Your faith will never grow, unless you intentionally put yourself in situations where you need God to show up or else you crash and burn. 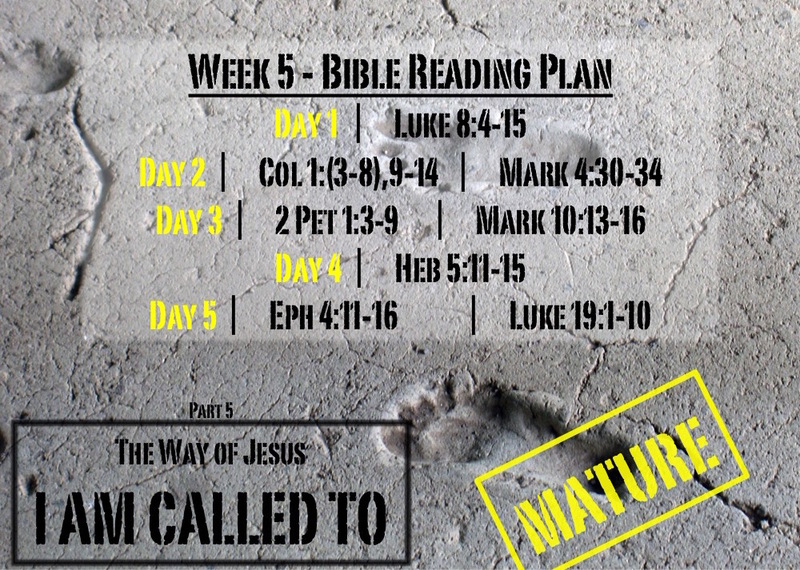 This sermon series includes a weekly Bible Reading Plan. Each week we read in preparation for the sermon coming next week. 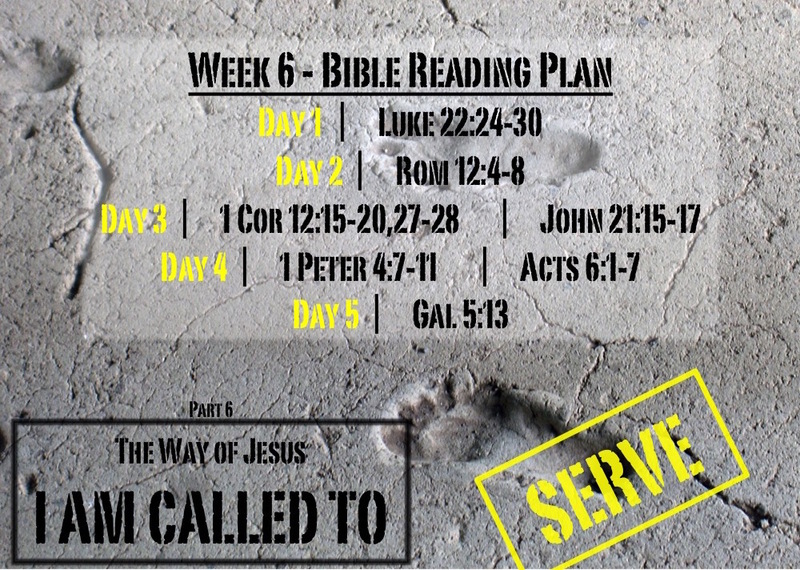 Next week we will discuss The Way of Jesus - I am called to SERVE, so this week we will be reading about serving the Body of Christ with our Spirit given gifts using this WEEK 6 READING PLAN. Tips and suggested questions available on the PDF. Posted in Sermons and tagged Born Again, Called to Mature, Clayton, Complete but not Finished, Following Jesus, Growing in Christ, More and Better Disciples, Reborn, Spiritual Maturity.